Beautiful. Well-behaved. Laid-back. Affectionate. Sweet. Docile. Charming. Friendly. Energetic. Loud. Funny. These are some of the words used to describe Harlequin Macaws. This hybrid bird is known for its striking features, impressive intelligence, wide vocabulary and outgoing, captivating personality. In fact, the word "harlequin" means "clown" -- and these playful birds truly live up to that reputation! But before you rush to adopt one, there are a few key things to consider. For example, their loud voices can wake you up at any hour of the night. And their social nature means you'll need to play with them a few hours every day. Read on to learn the top 10 things you should know before adopting a Harlequin Macaw bird. 1. They are hybrid birds that are a cross between a blue and gold macaw and a green-winged macaw. 2. Only bred in captivity. 3. They can get big, even for parrots. 4. Harlequins are extremely friendly, social and vocal. 5. Mostly live in their cages, but they do need to be let out every day to fly around, play and socialize. 6. They like many foods. 7. Harlequins are very smart. 8. Harlequins have very long lifespans. 9. They need plenty of exercises. 10. Can be very loud. The combination of these two very highly-regarded pet birds creates their striking colors. When the blue and gold macaw and green-winged macaw mate, the male gives the dominant gene that creates their colorful appearance. You'll see a big range of colors, color combinations and patterns. However, most are orange on their chests and bellies, with green and blue on their backs. Many have gold feathers under their tail feathers. And as far as personality goes, they typically inherit the docile side of the green-winged macaw and the clownish personality of the blue and gold macaw. However, both birds are known for having laid-back, affectionate personalities, so these birds usually inherit that too. It's very rare to find one in the wild. In fact, they are one of the most popular types of hybrid birds that have been successfully bred in captivity for many years. It's usually easier to find them for sale than it is to find some of the less commonly bred hybrid birds. That's why, in recent years, they have become very popular pets. These beautiful birds usually end up being a little more than two pounds and about 34 to 40 inches in length, from the beak to the tip of the tail feathers. They usually inherit their girth from their green-winged macaw parent. Their wingspan can typically reach about 40 inches or more. So if you want to adopt one, be prepared to get a big cage! Especially if these birds are socialized at an early age, they can become very good talkers and tend to speak to anyone who will listen. They're generally very intelligent, talk a lot and even laugh sometimes! But in order to make good pets, they require good socialization and training from a young age. Otherwise (and even sometimes in spite of training), they can be extremely noisy birds. As super-friendly birds, they need lots of human interaction to stay happy, healthy and well-adjusted. As a social bird, they love being part of a flock. With that in mind, you should try to include your bird in as many activities as possible to help him feel like just another member of the "flock." Our Editor listed best macaw ﻿﻿cages available in the market after researching a lot, based on verified users feedback, ratings, durability and price. They really enjoy playing in a playpen or on a parrot perch in their cage. It's important to keep your bird's cage stocked with plenty of food, toys and other things to keep him occupied so he doesn't get bored! But they can't live in their cages all the time. They do need to be let out for a few hours every day to get some much-needed exercise and socialization. They are usually very good eaters, typically enjoying a variety of high-quality seeds, nuts, bird-safe fruits and vegetables, commercial pellets and many of the same healthy foods that humans eat. A varied diet made up of these healthy foods will help your bird receive the best nutrition and help him live a long, healthy life. One important note: Never feed your bird avocado, as it may be toxic! In addition, be sure that your bird always has fresh water to drink. Most are easy to train and love learning new tricks. Many of these birds have a vocabulary of about 15 words or expressions that they use regularly to fit in with the rest of the family. You may even be able to teach your bird to greet you each day with a cheery, "Good morning!" This is partial because they want to communicate with you, and partially because it's a way for them to feel like true members of the family. They generally pick up on training cues very easily and embrace any opportunity to learn something new. Most common garden birds have a life span of between two and five years. The life span of a mini macaw is 20 to 25 years. But this bird has them all beat! 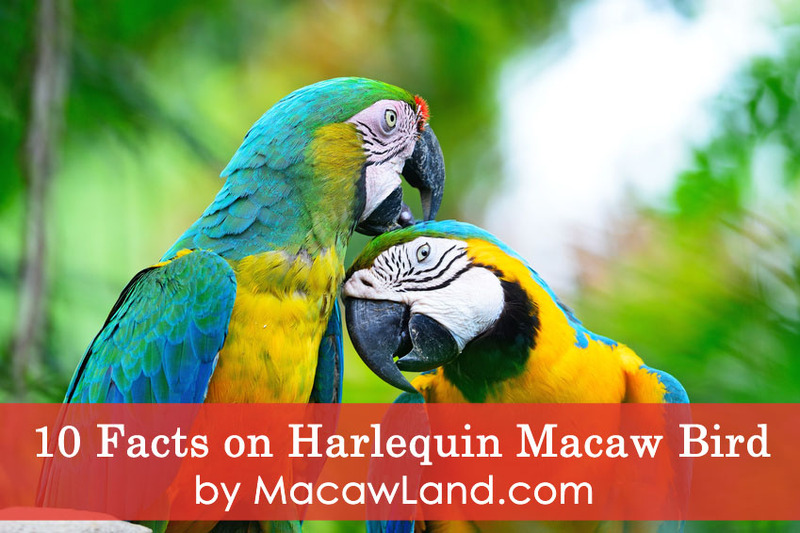 On average, harlequin macaw can live 40 to 60 years or more. Can you believe that? However, at age 40, most begin to slow down a bit and show signs of aging. But even then, some can go on to live 20 more years after that! To ensure that your bird stays in top physical and mental shape, it's important to give him plenty of exercises. Even though these birds enjoy being in their cages, they need to get out about three to four hours per day to play, interact with people and things, as well as get some exercise. This not only prevents excessive weight gain and allows your bird to stretch his wings, it also helps prevent boredom. If they get bored or don't get enough attention, they've been known to chew on furniture, bite people and become destructive around the house. To prevent this, make sure to keep him occupied outside his cage for a few hours every day. Hold him lovingly, give him plenty of toys to play with and let him fly around to get some energy out. All parrots are known for being loud, but these are truly known for ear-shattering vocals. Sometimes they can even scream at the top of their lungs early in the morning! Typically, these birds are only extremely loud when they aren't handled well, become bored or don't have their basic needs met. But sometimes, even when they're well taken care of, they can simply be ornery and just start screaming. They have a lot to say and they don't care how loud they have to say it or what time of the day it is! Harlequin Macaws are some of the world's most beautiful, intelligent, engaging, affectionate, funny and social birds. It's no wonder that they have become such popular pets in recent years. They can make absolutely amazing companions, sometimes even for a lifetime. However, they should not be bought on a whim. Remember that they can live 60 years or more! Are you prepared to take care of something for that long? And remember that their voices can sometimes be so loud that they can wake people up in the wee hours of the morning. Are you OK with occasionally being woken up by a bird wanting attention? In addition, they need big cages, high-quality food, many toys and potentially a lot of veterinary care (which means a lot of veterinary bills). If you understand everything required to give a Harlequin Macaw a great life, then go ahead and adopt one to give him a much-needed loving home. But if you have any hesitation about tending to their many needs, it's probably a good idea to hold off. Consider everything outlined above and then make your decision wisely!